Gordon Vayo limps in on the button and Qui Nguyen raises to 9,500,000 out of the big blind. Vayo folds. Qui Nguyen raises to 8,500,000 on the button and Gordon Vayo folds. Gordon Vayo limps in on the button and Qui Nguyen moves all in from the big blind. Vayo folds. Qui Nguyen limps in on the button and Gordon Vayo moves all in for 47,500,000 out of the big blind. Nguyen folds. Gordon Vayo moves all in for 44,000,000 on the button and Qui Nguyen folds. 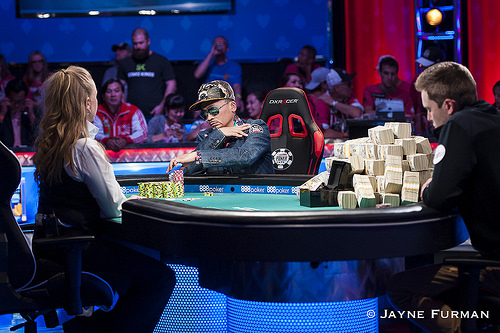 Qui Nguyen raises to 8,500,000 on the button and Gordon Vayo calls from the big blind. The flop is and Vayo checks. Nguyen moves all in and Vayo folds. Qui Nguyen raises to 8,500,000 on the button and Gordon Vayo calls from the big blind. The flop is and Vayo checks. Nguyen bets 13,500,000 and Vayo folds. Gordon Vayo limps in on the button and Qui Nguyen checks his option in the big blind. The flop is . Both players check and the turn is the . Nguyen checks and Vayo bets 4,000,000. Nguyen folds. Nguyen bets 11,500,000 and Vayo folds. Gordon Vayo limps in on the button and Qui Nguyen checks his option. The flop is and Nguyen checks. Vayo bets 3,500,000 and Nguyen folds. Qui Nguyen raises to 7,500,000 on the button and Gordon Vayo calls from the big blind. The flop is and Vayo checks. Nguyen checks back. The turn is the and Vayo checks again. Nguyen bets 11,500,000 and Vayo calls. The river is the . Vayo checks and Nguyen bets 17,500,000. Vayo calls. Nguyen shows , good for a pair of jacks, and Vayo mucks his hand. Gordon Vayo limps in on the button and Qui Nguyen checks his option in the big blind. The flop is and Nguyen checks. Vayo bets 3,200,000 and Nguyen folds. 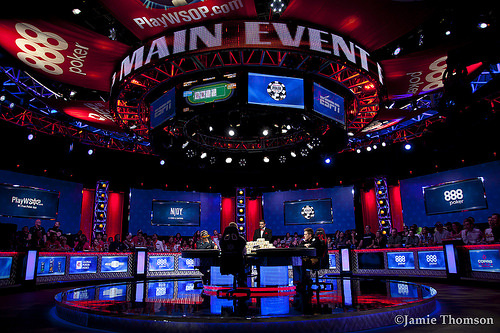 Qui Nguyen limps in on the button and Gordon Vayo checks his option in the big blind. The flop is and Vayo checks. Nguyen checks as well and the comes on the turn. Both players check again and the river is the . Both players check again and Nguyen wins the pot with .